Bachelor of Medicine from University of Medicine and Pharmacy iasi (Romania) 2002. Certificate in Skin Cancer – Australian College of Skin Cancer Medicine (2007). 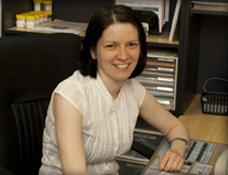 Alex started working in Belgrave Medical Clinic in September 2009. She enjoys working with children, dermatology and Women’s Health. Alex is also actively involved in teaching Registrars. During her training, Alex worked in Rehabilitation Medicine, Emergency, General Surgery, Paediatrics, General Medicine, Cardiology through various Metropolitan and Regional hospitals in Victoria. Most of her GP training requirements were successfully fulfilled in a challenging rural environment in Medical Clinics and Hospitals in East Gippsland, Victoria. In her spare time Alex enjoys reading, painting, cooking and spending time with her sons.